It took me quite some time to figure out what the best way was to make something that had none of these disadvantages. 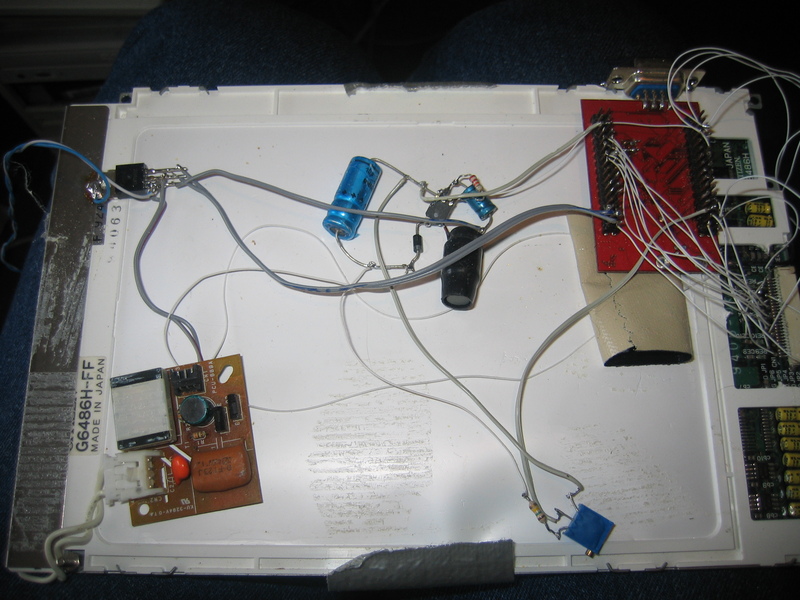 Eventually, I settled on creating an OS-less device from a microcontroller, an LCD and a touchscreen. That way, the device can be hung on the wall like a painting, so the risk of drowning it in beer gets a lot smaller. The touchscreen is something I picked up from a local electronics store. It was attached to a really nice color TFT, which unfortunately proved quite difficult to control, that's why I didn't use it. The touchscreen is a resistive one with 4 wires: Basically, to get the right coordinates, you put a voltage across 2 of them and the voltage at either one of the other 2 wires indicates where on the X-axis the user has touched the screen. Swap the 2 wire-pairs and you can do the same for the Y-coordinates. These measurements can't be used immediately because they jitter too much, so there's a little algorithm going on in the microcontroller to make sure that the right position is detected. Close-up of the touchscreen and LCD. As you can see, I didn't bother with a connector for the tiny flatcable. The LCD is ripped out of an old 486 Compaq Armada. I was lucky enough to find the pinout for it somewhere on the Internet. Basically, it's controllerless, so you need to keep feeding it pixels to get it to display something. Another problem is that it needs 13.5V as a bias voltage. 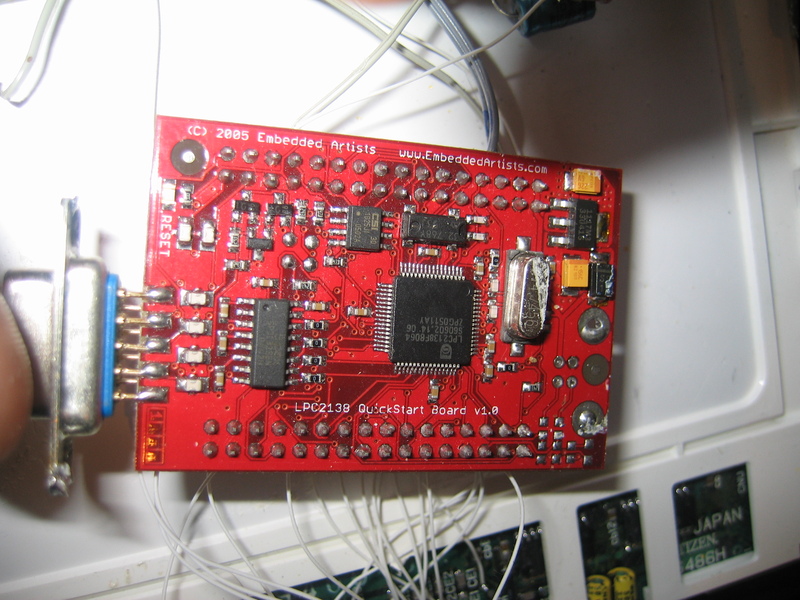 As a microcontroller, I used an Philips (now NXP) LPC2138. That's an ARM7-processor running at a maximum of 60MHz. Its pre-soldered on a prototyping board I bought from Embedded Artists and the board includes a power-supply, RS232-out and a reset/i2c-EEPROM-ic. Aside from the aforementioned things, a few more components are needed to get it all to work. First up is a 7805, which converts the semi-unregulated 12V that I feed into the device to a nice 5V which can be used by the other components. 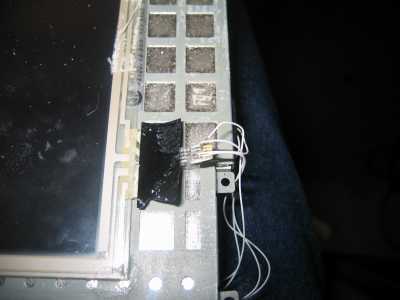 The 7805 uses a bit of shielding of the LCD for its cooling. Secondly, as mentioned before, the LCD needs a bias-voltage of about 13.5V to function. This is taken care of by a small boost-converter, connected to an PWM-out and analog-in on the microcontroller. The LCD needs a small pot to modify the contrast, too. Thirdly, the LCD is a translucent one so it needs a backlight to function. That backlight already is inside the LCD as a CCFL, which needs to be connected to an inverter. I didn't have the original inverter from the Armada laptop anymore, so I just connected another, random, one. While such random inverter-swapping could kill the CCFL, this one seems to work OK and has done that for about a year now.